Screen shot courtesy of Coyote Moon, Inc. Disk Utility’s First Aid feature is able to verify the health of a drive and, if needed, perform repairs to the drive's data structures to prevent minor problems from turning into major issues. With the advent of OS X El Capitan, Apple made a few changes to how the Disk Utility First Aid feature works. The main change is that First Aid no longer has the ability to verify a drive independently of repairing it. Now when you run First Aid, Disk Utility will verify the selected drive, and if errors are found, automatically attempt to correct the problems. Before El Capitan, you could just run the Verify process on its own, and then decide if you wanted to attempt repairs. 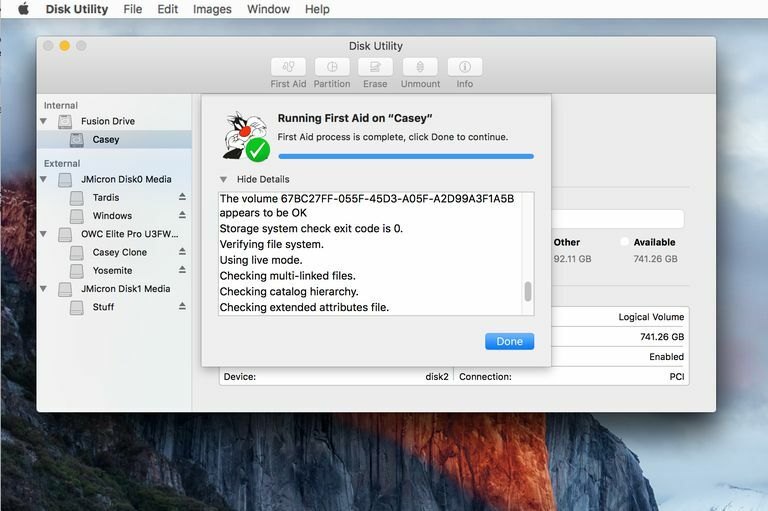 You can use Disk Utility’s First Aid on your Mac’s startup drive. However, in order for First Aid to perform any repairs, the selected volume must first be unmounted. Your Mac’s startup drive can’t be unmounted since it's in use, which means you will have to start up your Mac from another bootable device. This can be any drive that has a bootable copy of OS X installed; alternatively, you can use the Recovery HD volume that OS X created when it was installed on your Mac. We'll give you instructions for using Disk Utility’s First Aid on a non-startup volume, and then for using First Aid when you need to repair your Mac’s startup volume. The two methods are similar; the main difference is the need to boot from another volume instead of your normal startup drive. In our example, we'll use the Recovery HD volume that was created when you installed OS X. Because you'll probably be using Disk Utility occasionally, I suggest adding it to the Dock, to make it easier to access in the future. The Disk Utility window appears as three panes. Across the top of the window is a button bar, containing commonly used functions, including First Aid. On the left is a sidebar that displays all the mounted volumes connected to your Mac; on the right is the main pane, which displays information from the currently selected activity or device. Use the sidebar to select the volume you wish to run First Aid on. The volumes are the items just below a device's primary name. As an example, you may have a Western Digital drive listed, with two volumes below it named Macintosh HD and Music. The right pane will display information about the selected volume, including size and amount of space used. With the volume you wish to verify and repair selected, click the First Aid button on the top pane. A drop-down sheet will appear, asking if you wish to run First Aid on the selected volume. Click Run to start the verification and repair process. The drop-down sheet will be replaced with another sheet that shows the status of the verification and repair process. It will include a small disclosure triangle in the bottom left side of the sheet. Click the triangle to show details. The details will reveal the steps being taken by the verification and repair process. The actual messages displayed will vary by the type of volume being tested or repaired. Standard drives may show information about catalog files, catalog hierarchy, and multi-linked files, while Fusion drives will have additional items that are checked, such as segment headers and checkpoints. If there are no errors found, you'll see a green check mark appear at the top of the drop-down sheet. If errors are found, the repair process will begin. If First Aid reports that the drive appears to be OK, or that the drive has been repaired, you’re done. In some previous versions of First Aid, it was necessary to run the repair process multiple times to ensure the repairs were complete; that is no longer required. If First Aid displays an “overlapped extent allocation” error, Disk Utility will create a DamagedFiles folder at the root level of your startup drive. The overlapped error indicates that two (or possibly more) files occupied the same location on the drive being repaired. More than likely both files have become corrupt, but there's a small chance you can recover one or both of them. You can examine the files in the DamagedFiles folder. If you don’t need the file, or you can easily recreate it, I highly recommend just deleting the file. If you must have the file, then check your backup for a usable copy. If First Aid reports, “The underlying task reported failure,” this indicates First Aid failed at making the needed repair. However, don’t give up; try rerunning the repair a few times. If repairs aren't successful, and you have a backup of all the data stored on the affected drive, then I recommend reformatting the drive and performing a clean install of OS X. You can then restore your backup data using the Migration Assistant. Disk Utility’s First Aid has a special “live mode” it will use when you run it on the startup drive. However, you're limited to only performing a verification of the drive while the operating system is actively being run from the same disk. If an error is found, First Aid will display an error, but make no attempt to repair the drive. You'll find complete step-by-step instructions for how to boot from the Recovery HD volume and start Disk Utility in our guide: Use the Recovery HD Volume to Reinstall OS X or Troubleshoot Mac Problems. Once you have successfully restarted from the Recovery HD, and have launched Disk Utility, you can use the method above for using First Aid on a non-startup drive to verify and repair the drive. How Can I Repair My Hard Drive If My Mac Won't Start?